Diabetic Retinopathy - Associated Retinal Consultants P.C. Diabetic retinopathy is the most common cause of blindness in working adult Americans. It affects approximately 50% of all patients with diabetes. It is more common in patients with Type I insulin dependent diabetics, but is also very common in patients with Type II diabetes. The high sugar levels in the blood in diabetes can be toxic to the small blood vessels throughout the body, and in the retina can cause ischemia (loss of blood flow), hemorrhages, and diabetic macular edema (swelling in the retina). In advanced cases, this ischemia can cause new abnormal blood vessels to grow in the retina or elsewhere in the eye, causing proliferative diabetic retinopathy (PDR). This is an ominous condition that can often lead to retinal detachment, pain, glaucoma, and blindness. 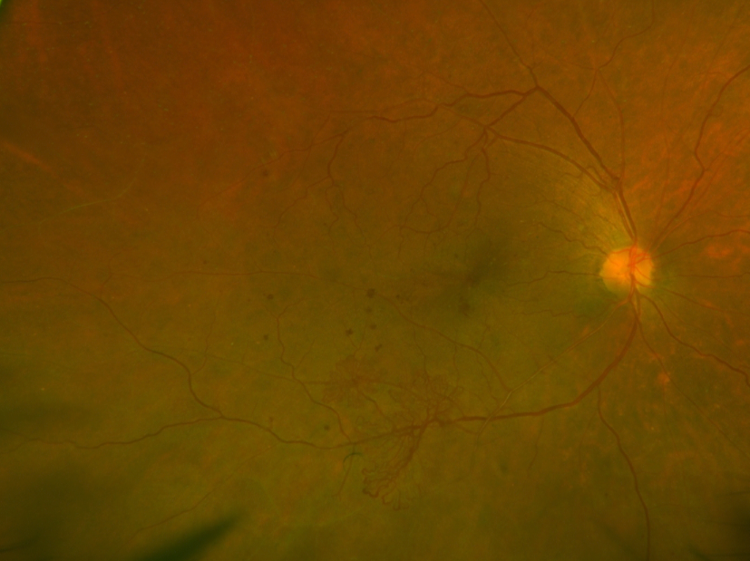 Fundus photo of proliferative diabetic retinopathy (PDR). Note microaneurysms, dot blot hemorrhages, ghost vessels, and fronds of neovascularization elsewhere. Mid phase fluorescein angiogram image in PDR highlighting neovascularization of the disc and elsewhere. Note extensive capillary drop out and filling defects as well. Risk factors for development of diabetic retinopathy are duration of disease, poor control of diabetic sugar levels (as measured by HbA1c), high blood pressure, high cholesterol. Diabetic retinopathy can also worsen during pregnancy. Your doctor will do a complete eye exam including a dilated examination to look for diabetic changes including abnormalities of the blood vessels, swelling in the retina, evidence of ischemia, or any new blood vessels or scar tissue in the retina. Diabetes can cause hemorrhages in the retina or lipid deposits, and can cause damage to the blood vessels in the retina. Your doctor may order fundus photography to document the level of diabetic retinopathy. Optical coherence tomography (OCT) scans can be a valuable tool to assess for macular swelling and assess response to any needed treatments. Patients may also require fluorescein angiography (FA) to assess the health of the retinal circulation and blood vessels. In this test, dye is injected into a peripheral vein in the patient’s arm, and then retinal photos are taken as the dye circulates through the retinal vessels. The dye is made from plant material, is generally safe, and is different from dyes used for CT or MRI scans. 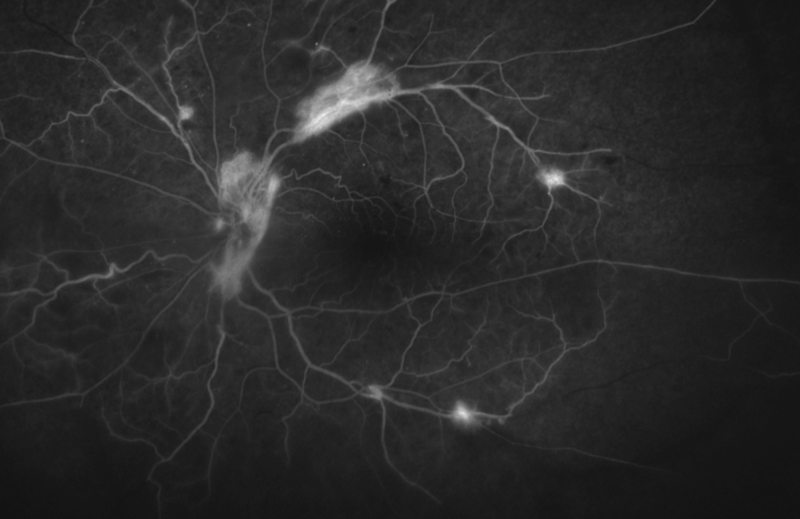 Fluorescein angiography can help categorize the level of diabetic retinopathy and can help guide treatment strategy. Anti-VEGF medicines can be given during a short office procedure. These medicines have been shown to decrease leakage from the damaged blood vessels in diabetic retinopathy and help prevent growth of new abnormal blood vessels. Clinical trials have shown that with frequent dosing, after years of treatment the changes from diabetic retinopathy can actually be reversed in many patients. The three drugs in this class are bevacizumb (Avastin), ranibizumab (Lucentis), and aflibercept (Eylea). Dosing schedules are individualized to the patient, and can be variable. Intraocular injections of steroids have also shown to be effective in treating the swelling related to diabetic retinopathy. Steroids have a different side effect profile, including the potential for increased intraocular pressure which can lead to glaucoma and potential for increased cataract progression. These side effects are often treatable. Laser treatments to the retina are commonly used to treat diabetic retinopathy. Focal laser can be used to treat macular swelling in certain circumstances to help prevent vision loss. Light laser pulses are applied to the diseased areas of the macula in the office. In proliferative diabetic retinopathy (PDR), many patients require panretinal photocoagulation (PRP) laser, where many laser spots are placed around the periphery of the retinal to help reduce the ischemic burden on the retina and prevent potentially visually damaging complications such as detachment or glaucoma. Diabetic retinopathy is a common finding in diabetic patients. All patients with diabetes need dilated eye exams at least once a year to monitor for these changes. Your doctor can help determine how often you need to return for examination, and treat you if needed. In addition to taking your medicines as prescribed, patients should attempt to keep their blood sugars and blood pressures under control. Keeping physically active and a weight loss regimen can be helpful for some patients. We counsel our patients to stop smoking if applicable. For some patients, not all of their vision loss can be reversed. However, your doctor can help you optimize your visual potential.